I was always ‘one of those people’ who had not read To Kill A Mockingbird, and people’s amazement and indignation at this did nothing but annoy me. It did not make me want to read the book, despite it looking like something I would really enjoy. It was only the recent announcement of the discovery of the unpublished manuscript of Go Set A Watchman, written before Mockingbird, that prompted me to look at it again. It is a book I would have read, should have read – and in some ways I wish I had read it years ago. My older sister, at the same school as me, studied it for GCSE, but by the time I reached that year it had been replaced on the curriculum by Lord of the Flies. My sister loved studying Mockingbird and I was annoyed that I was denied this chance, but the fact is I fell completely in love with Lord of the Flies and count it as the book that made me love literature in the way that I do now. So really I can’t complain that I had to study that instead – and honestly I’m not sure how likely it would be that I would read it on my own as adult, having known little about it beforehand. It is a book that is crucial to read as a ‘young person’ I think, and 15/16 was the perfect age for me to read it. Anyway. 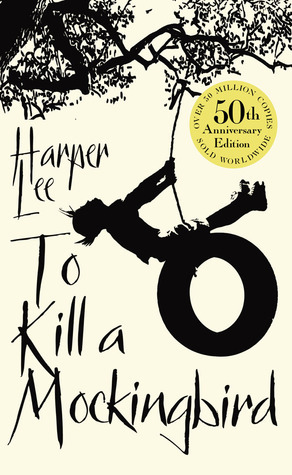 So I thought I may as well bite the bullet and read To Kill A Mockingbird, as the premise and story behind Go Set A Watchman was so intriguing and I knew that I would want to have read the first novel when the second one was published and everyone went into a fever about it. I also adore Truman Capote, his writing and his world, and knew that I would find something similar in Harper Lee’s writing that I could love. And I did. Her style instantly reminded me of Capote’s Southern stories, and Scout could easily have been Idabel in Capote’s Other Voices, Other Rooms (a character that was based on Lee herself). The small Southern town was perfectly, perfectly evoked, with the heat and outdoorsy-ness of Scout and Jem’s life making them sit perfectly alongside Joel and Idabel in Other Voices, and Mick in Carson McCullers’ The Heart is a Lonely Hunter. They are all children trying to make sense of their world, and as adult readers their viewpoint reminds us of the often cruel nature of life in the early twentieth century. The setting and time period means that race is an inevitable issue, and Tom Robinson’s trial is often described as being the main plot point of To Kill A Mockingbird – but for me the book was about so much more than that. The trial, though seismic, does not take up that many pages. The book is more about the effect that the trial has on Maycomb and its inhabitants, and the ways in which prejudice and human nature, as well as social conventions, manifest themselves in everyday life. It is also, hugely, a book about the significance of family. Scout, Jem, and Atticus, along with Calpurnia, are a tight-knit and charming family, one that I loved instantly for their intuitiveness and intelligence, and their lack of sentimentality. They are contrasted sharply with the Ewells, the family at the centre of Tom’s trial. They are backward in every sense of the word and their complicated relationships, as well as their attitudes to other people that are brilliantly analysed during the trial, are of another world entirely separate from the Finches. Reading about them made me angry at the unnecessary ignorance, prejudice, and fear that makes them act as they do. I felt sorry for everyone involved (except Bob Ewell, whom it would be hard to redeem). I know we have progressed from the time of the novel, but it is a fact that we have not progressed enough. My last note here will be about gender. I couldn’t help but notice the number of times that Scout’s being a girl is mentioned in the novel. Her Aunt Alexandra wishes she would be more feminine and start to behave ‘like a lady’ as she gets older, but Jem’s attitude to Scout’s gender is also interesting, as well as her own. She knows that she does not behave as little girls are necessarily supposed to, with her dungarees and running around with boys, but she also doesn’t really see why she can’t just be as she is (which is the beauty of childhood). But as Jem gets older he seems to tell her off for not behaving as she should, and yet moan that sometime she is too much of a girl. These two children are learning literally everything about their society as they grow up, and the gender rules seem to be as complicated as those relating to race. I was saddened by their having to learn about the unpleasant sides of life, but was glad that they remained good, and were lucky enough to have Atticus as a father. A man to be admired if ever there was one. Originally published by J. B. Lippincott in 1960, and countless times since. Huge sigh of relief that you liked it! You make me want to reread this – and see if I still feel the same way about it as I did when I was 15/16. That’s lovely to hear Marina! Thank you. I know what you mean about ‘Lord of the Flies’. Despite the fact we had to tear it apart I still love it to this day. However ‘Go set a Watchman’ is received, the most wonderful thing I’ve witnessed (amongst all the fretting over Lee’s welfare, etc) is everyone revisiting/panic reading the original. It is wonderful and I do need to revisit myself. We went to see a stage adaptation of it in Manchester a while back and it just reminded me of how I felt first time around 🙂 You know there are all kinds of rumours flying around about whether Capote actually wrote To Kill a Mockingbird/Harper Lee wrote In Cold Blood??! Yes, I’ve heard those rumours and think they’re awful! I’ve read a lot of Capote and can see he wrote In Cold Blood, and Lee wrote Mockingbird – to me there is no question. They grew up together, and worked together, and they do have some similarities in their style and of course setting, but I don’t think they wrote any of each other’s work. I’m sure they advised etc, but that’s it. This is interesting and wonderful. Thanks for sharing! If you’re ever in need of some great book reviews and musings be sure to follow! Thanks!